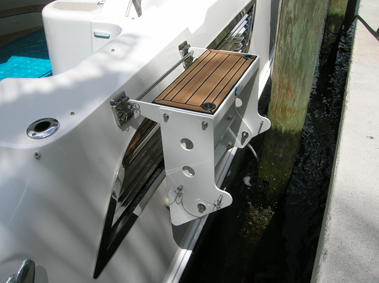 New Wave Fabrication offers the Tide Rider Steps as an excellent and elegant addition to your luxury boat. These folding boat steps are constructed from the highest quality materials. They are functional, durable and sturdy, and can be custom fit to any boat as required. Tide Rider Folding 2-Step Stairs are one of the featured boat stair products at New Wave Fabrication and we are confident you cannot find a better stair. The Tide Rider Folding 2-Step Stair comes complete with two sets of mounting brackets, a one tube handrail and a black, nonskid surface for safety and comfort. This convenient, folding stair can be used in place of the Tide Rider Boarding Stairs when using a narrow dock or other tight space to on-board and off-board. 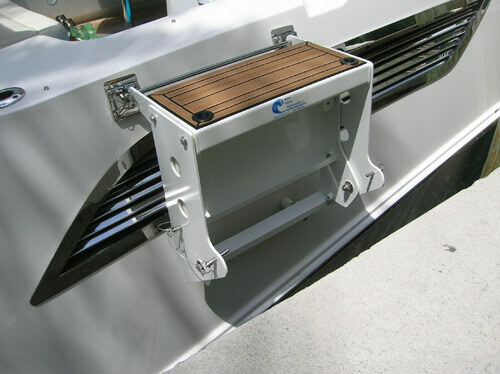 When a boat is at low tide, the bottom step of the Tide Rider 2-Step can be folded up for easy stowage. The entire stair folds into the size of a small suitcase. The Tide Rider Folding 2-Step Stair also comes in a powder coated or anodized finish. If you require specific customizations, just ask your friendly sales representative. With its sleek and compact design, the Tide Rider Folding 2-Step Stair is all about comfort, convenience, safety and style. This fine boat stair makes a beautiful and functional addition to any boat, and is an accessory every boat owner should consider. 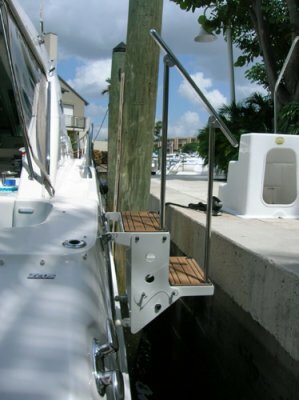 This boat stair allows you to dock in a variety of situations that may not be possible with a larger stair. This is especially critical when boating with children or elderly people who may not be comfortable climbing up a ladder. When docking to a narrow dock, the Tide Rider Folding 2-Step Stair can be used in place of the Tide Rider because of its uniquely streamlined design. Everyone At The Marina Was Impressed! The folding step you designed for our Sea Ray makes boarding for my wife so easy and safe. Everyone at the marina was impressed at the quality and most of that this did not protrude on to the dock. My wife and I both thank you. Contact New Wave Fabrication to Order a Tide Rider 2-Step Today! New Wave Fabrication specializes in the sleek design and certified fabrication of stylish, sturdy boat stairs and boat boarding stairs for boats of all sizes. Ideal for the comfortable boarding of even the largest boats, the stairs from New Wave Fabrication are built to last, for style, safety and comfort. The Tide Rider Boat Boarding Steps are no exception. The non-skid surface and sturdy handrail situate the Tide Rider 2-Step among the most reliable boarding stairs on the market. Tide Rider 2-Steps are an attractive addition for your vessel at an affordable price. These are among the lightest weight boat stairs and are some of the most finely crafted. 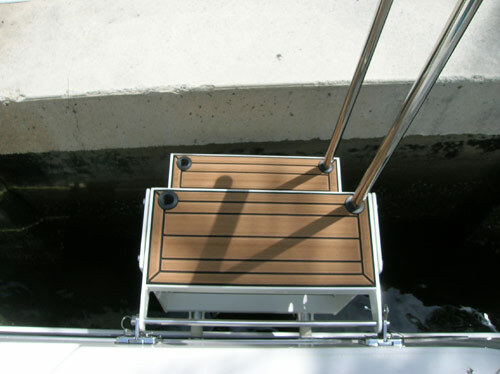 Tide Rider 2-Step Stairs feature a beautiful finish, compact folding design, teak wood, and a sleek look that provides a classy compliment to any boat. Choose the Best Stairs for your Luxury Boat! New Wave Fabrication understands that safety, style, durability and form all go together when it comes to boat steps. The Tide Rider 2-Step is lighter in weight than any comparable product, but it is also extremely durable, secure, safe and stylish. Form and function come together in a brilliant and unique fashion with the elegant Tide Rider 2-Step Stair. New Wave Fab takes great care in constructing a boat step that offers premium traction, secure hand rails, and nylon bushings to eliminate electrical activity.